Home Our Faculty and Staff Research Faculty Hector R. Mendez-Gomez, PhD. Hector R. Mendez-Gomez is a Research Associate Scientist in the RNA Engineering Laboratory at the University of Florida Brain Tumor Immunotherapy Program (UFBTIP) and Preston A. Wells, Jr. Center for Brain Tumor Therapy. Dr. Mendez-Gomez received his master’s degree in biochemistry from the University of Salamanca (Spain) in 2004, and his PhD from the Autonomous University of Madrid (Spain) in 2009. During his training, Dr. Mendez-Gomez studied the prospects of reprogramming neural stem cells (NSC) to establish cellular therapies for neurological disorders such as Parkinson’s and Alzheimer’s disease. 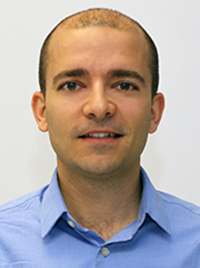 He worked at the Cajal Institute (Madrid, Spain) as a postdoctoral Associate until 2011, when he joined Dr. Nicholas Muzyczka’s laboratory as a postdoctoral associate at the University of Florida’s Cancer and Genetics Research Complex. There he developed gene therapy strategies for brain disorders and tackled the persistent problem of how to effectively overcome the blood-brain barrier to deliver drugs into central nervous system. In 2015, Dr. Mendez-Gomez joined the University of Florida faculty in the Department of Molecular Genetics and Microbiology. In 2017, he joined Dr. Elias Sayour’s RNA engineering laboratory in the Department of Neurosurgery and is currently focused on developing novel targeted therapeutics against malignant brain tumors. Specifically, Dr. Mendez-Gomez engineers novel designs of messenger RNA directed nanomaterials against the most common pediatric and adult brain cancers.